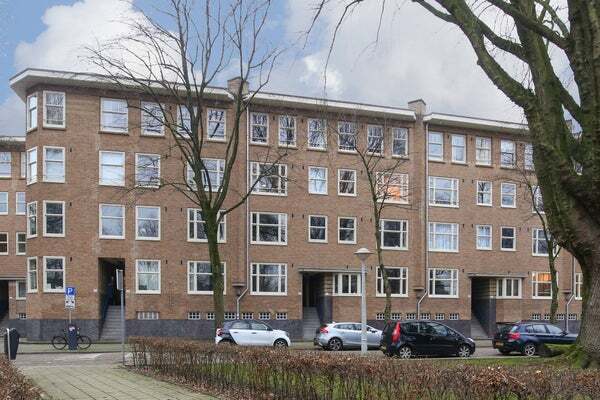 Modern and quiet upholstered 2 bedroom apartment, a mere stones throw from Jordaan and Oud West, and gorgeous views of a park and water right out front and use of a shared garden. The apartment is one flight of stairs up from ground floor and all on one floor. One enters the apartment into a hallway that connects all the rooms (2 bedrooms, kitchen and living/dining) with each other. The living/dining is located on the street side and offers views of a small park on the edge of a canal. The kitchen is in between the two bedrooms located on the back side overlooking the shared garden, one large and one very small one. Also overlooking the shared gardens is a large balcony facing west. The bathroom is located in between these rooms and the living and is equipped with a shower, toilet and large wash basin as well as connections for the washer and/or dryer. The apartment has a small (3-4m2 storage as well. The apartment may be shared, please inform about the possibilities. The rental price will be higher for two persons sharing (not forming a household).